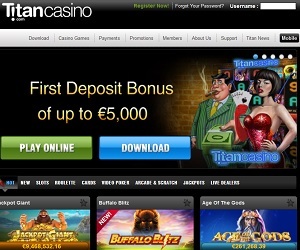 Titan Casino was launched in 2008 and in such a short space of time has already had such a massive impact on the online gambling community with its approach to marketing and delivering an elite package for the players. It has the complete package any gambling fan dreams about: mouth watering bonus, huge variety of games, great Playtech software and a state of the art customer service. The site offering comes in 13 languages, including Italian, Spanish, German and many others. Unfortunately American players cannot enjoy all that TitanCasino.com has to offer. The software that Titan Casino uses is Playtech. Playtech is one of the biggest, if not the biggest, software developers in the online gambling industry so the fact that the site uses Playtech software shows that you are going to get a superb gaming experience. The site’s design looks sublime and offers an easy-to-navigate menu whilst keeping the look fresh and clear. The Las Vegas background really makes it feel like TitanCasino is bringing Sin City into your living room. Lobby is easy to use and while playing any of the hundreds of games on offer you get a real, vivid playing experience that only top software can provide. There is plenty to see and do at the site. Whatever you want, Titan Casino is pretty sure to have it covered. A huge slots variety, Progressive Jackpots, Blackjack, Roulette, Live Dealer Games, Casino Hold’em, Video Poker, Arcade Games, Flash Games, TV Games and wealth of new games that is constantly updated ensure your experience goes further than just the casino games. All of the standard payment options are available, including Visa, Mastercard and Maestro. The site also offers match bonuses for deposits made using such methods as Moneybookers, Neteller, ClickandBuy and UKash. All withdrawal requests are subject to a pending period before they are approved. Titan Casino has a comprehensive customer support service with telephone, fax and chat available 24/7. There are also email options depending on your query with contacts for VIP, marketing, feedback and support.